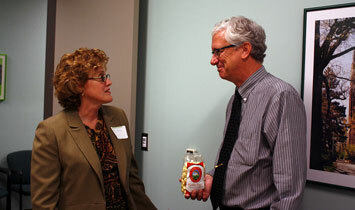 Betty Blase, MSU Extension District 7 Coordinator, and Jim Talen, Kent County Commissioner. I mentioned in a recent Spotlight article that our Michigan State University Extension community food systems educators Kendra Wills and Garrett Ziegler moved into their new office space in the Grand Rapids Downtown Market on Sept. 1. The two work at the site full time, joined one to two days a week by Diane Smith, innovation counselor from the MSU Product Center Food-Ag-Bio. 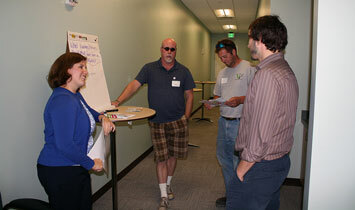 An Open House Reception took place Oct. 1 at the office located at 109 Logan Street SW, Suite B102. Guests enjoyed light refreshments from the Downtown Market food businesses. From left to right: Kendra Wills with MSU Extension at the Downtown Market, Jerry Adams with West Michigan Farmlink, Tim Sharer of Vertical Paradise Farms, and Garrett Ziegler of MSU Extension at the Downtown Market. In addition, visitors donated to support the Bethany Christian Services Hope Farms project. Hope Farms partners with Holland Home to provide employment and business skills to Nepali and Burmese refugees. These growers will be planting crops native to their homelands for sale in local markets. Hope Farms coordinators discussed the project at the event, which attracted 50 people including Sen. Mark Jansen R-Gaines Township, Kent County commissioners Jim Talen and Gary Rolls and Marcia Rapp, vice president of the Grand Rapids Community Foundation.